Great trick for dicing onions! In recent years, many school districts have made headlines for offering more natural, “made-from-scratch” selections on their lunch menus. But what if your child’s school is still serving a processed menu full of food additives? Many pre-packaged junk foods are masquerading as “natural” options at the grocery store. Unfortunately, “natural” is not a regulated term – it indicates nothing about the types of food additives the product may contain. Also, just because an item is sold at a “natural” food store or labeled as “organic,” that is no guarantee that it is additive-free. Always read the entire list of ingredients, and make sure you understand what every word means! Take advantage of the truly additive-free “short-cuts” that are available. Admittedly, these are few and far between. But if you look hard enough and scrutinize ingredients lists, you’ll find a few good store-bought snacks and treats made from truly natural ingredients. For example, at many natural health stores you’ll find serving-sized canned fruits and applesauce packets that contain no sweeteners, preservatives or other additives. Dried fruits without added colors, sweeteners or preservatives (e.g., sulfur dioxide) are also available at some grocers. If you don’t have access to these stores where you live, check online because many of these items are also available for purchase through natural health websites. More often than not, you’ll be sending perishable foods to school, so a brown paper sack simply won’t suffice. 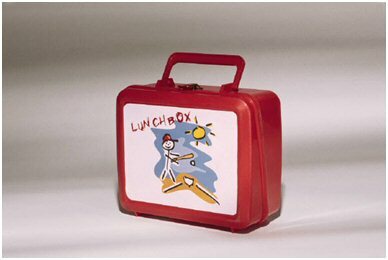 Check out the wide variety of lunchbox equipment and supplies that are now available online or at your local department store or natural health store. Ice packs, a lunch box, re-usable sectioned containers and a good thermos are must-haves. I have even seen nifty containers available online for sending frozen smoothies along for lunch! 4. Make your own nutrient-packed sweet treats! Homemade granola bars and muffins are easy options, and you can use them to disguise all sorts of healthful ingredients (e.g., shredded zucchini and carrots, nuts and berries). Recipes are available online for a variety of dietary restrictions, as well (gluten-free, dairy-free, grain-free, egg-free, etc.). Trail mix is a quick option, too. Just combine a variety of nuts, seeds and dried fruits. Make sure to check the ingredients list when purchasing these items because unhealthy oils, flavorings and other additives commonly lurk there. 5. Think outside the sandwich! Skip the processed bread, mayo and cold cuts. Send a variety of homemade entrees, instead! Leftover servings from last night’s dinner are a great sandwich replacement. Pasta salad is a fun main dish, too, and it’s a great vehicle for all sorts of cold leftover veggies; just be sure to make your own homemade dressing. You can add leftover chicken or some garbanzo beans for a heartier dish. Literally – schedule it out, and write it down! It takes a little more time in the beginning, but the peace of mind is well worth it. Once you’ve created a few weekly menus, you can simply rotate them. So within the first few weeks of school, all of your lunch planning is essentially done for the entire year! Guided by your menu, you can strategize and make large batches in advance of items that will store well in the freezer or fridge. Chop fresh veggies and boil and peel eggs for the next few days, and store them in the fridge so they’re ready to go. Bake muffins and granola bars in large quantities, and store them in the freezer for upcoming weeks. Be sure to make extra servings of dinnertime meals, too, so you can pack them in a thermos for lunch. Many dinners are well-suited to freezing, as well, so you don’t necessarily have to use them for lunch the very next day. Pack lunches the night before, so you’re not stressed or scrambling for ideas during your hectic morning rush. If you pre-slice fruits that are prone to browning (e.g., apples), sprinkle with a little fresh lemon juice before packing away. If your kids think their fruit is “rotten,” it’s more likely to end up in the trash than in their tummies. Get the kids involved in the planning and preparing of their lunches. They are much more likely to eat things if they were involved in the process and feel like they had choices. 10. Take a deep breath! Remember that you are doing your best. Your love and energy goes into the food you prepare, so remain calm about these lunch box changes, and transition your menu at a pace that works best for you and your family. Don’t stress out if your lunches aren’t perfect, and try not to feel resentful or overwhelmed about the extra time and energy it takes to prepare things from scratch. Instead, reflect upon how much you love your children and that you care enough to make sure they are well-nourished. While you’re at it, why not share your feelings with your child by adding a brief hand-written note to the lunch as a finishing touch? Did you like these tips? SUBSCRIBE HERE if you’d like to get more of our tips for natural health and happiness!